On the horizon lies several noble firs, a thick layer of fog, grass wet with morning dew, and a slowly approaching army of medieval warriors. Here one will find glory and nobility, castles rising strong from the cold grounds of the north. Here we find a vision of the medieval that is alive and strong, thrusting ourselves in the midst of that ancient scene. Compilations are a rare thing in dungeon synth, and I'm not sure the genre is very well-suited to them, however in the case of this album it serves a pretty good purpose, which is introducing us to a number of the currently-active Russian dungeon synth artists, particular those associated with the VK dungeon synth page (who are the ones that put together this compilation). Since compilations are varied by their inherent nature, I think this review would be best served going track-by-track. The first track, Saga About Old Sword And Forgotten Glory, is very clean and tight, folky, epic, with war drums, battle samples, a shrill flute, and a heavy consistent brass. It seems to glorify ancient battles, and has a strong underlying pagan feeling, to the point of being almost reminiscent of new age music, but I think it's subtle enough to just add a bit of a unique flavor to a decidedly dungeon synth track. It fits the theme of the album as well. The next track is on the opposite spectrum of dungeon synth: cheap keyboard, very little reverb, and sloppy playing. This one is more along the lines of ponderous medieval melancholy, similar to Født til å Herske. A sparse, foggy landscape of isolation and yearning. This is the familiar sound of a lone, melancholic dreamer wandering amongst cold plains and decrepit ruins. Not bad, but doesn't really explore any new territory. The third track is glorious and naturalistic, really does convey the feeling of some noble creature or spirit soaring over a landscape and amidst the clouds, seeing the trees, mountains, and castles in the vista below. It doesn't seem to go anywhere though, more like a brief glimpse into this animalistic experience. I'm almost reminded of Nest. The fourth track is repetitive, bright, and ancient. Really strong sense of nature and sunlight, like a pagan daydream, but not that hokey renaissance-fair type paganism, the real thing. Unique sort of atmosphere here, really visual and serene. Over repeated listens this track has grown on me strongly. The artist has a good ear for the level of minimalism best suited for daydreaming and being immersed in the atmosphere. Not a very dynamic song, but very effective at giving the listener a sense of place. The next track, Dungeon Ghost, is a bit repetitive and simple. Feels somewhat like a mantra of some sort, a small single line of runes carved into a forgotten stone. Feels like it's attempting to represent the impenetrable past, a past which is entirely alien to us today, incomprehensible even in its simplicity. That said, while it does have an effective atmosphere, I think it's an atmosphere a bit too simple to repeat as often as it does. It should either be more dynamic or half the length. Merlin-Sorcerer's Awakening is interesting, bombastic and fantastical, perhaps leaving dungeon territory a bit. It seems like this song is attempting to be a bit more symphonic, with a quite dynamic composition, however opposite the previous song, it seems to move much too quickly to ever let the listener explore the atmosphere on his own. I think dungeon synth necessarily needs to be a bit more detached, not engaging the listener quite so directly. Sunrise Over the Mountain Forest feels somewhat uninspired. It's tracks like these that make me wonder whether musical experience is a hindrance in making dungeon synth. This artist seems to have quite the traditional musical ability, however I sometimes feel that this leads to a "by the books" approach, which can act as a crutch. Or perhaps the vision being expressed just doesn't resonate with me so strongly; that can very well be the case here, since it is one of bright sentimental serenity, an atmosphere which I personally do not value much. Return to Erebor is very cool. It is synthy, with quite a few spacey patches, mixed in with the familiar medieval ones. Like many of the tracks here, it is heavy on the percussion, but that's not a bad thing. It makes the track quite powerful in this case. A whole album of this sort of material, I would question whether it is "pure" dungeon synth, but that's irrelevant since it's interesting and original. The last track is very vast and final, with a hint of menace, a sense of things coming to a final pass. Great for an ending. The lack of a riff-based structure and percussion make it seem a bit unrooted, compared to the sound of a lot of ds, and that works really well here and it still really has the dungeon tone. The unifying theme of this album is of the mythic element of a king/hero who is hidden away, before arriving out of the darkness into the light of day. 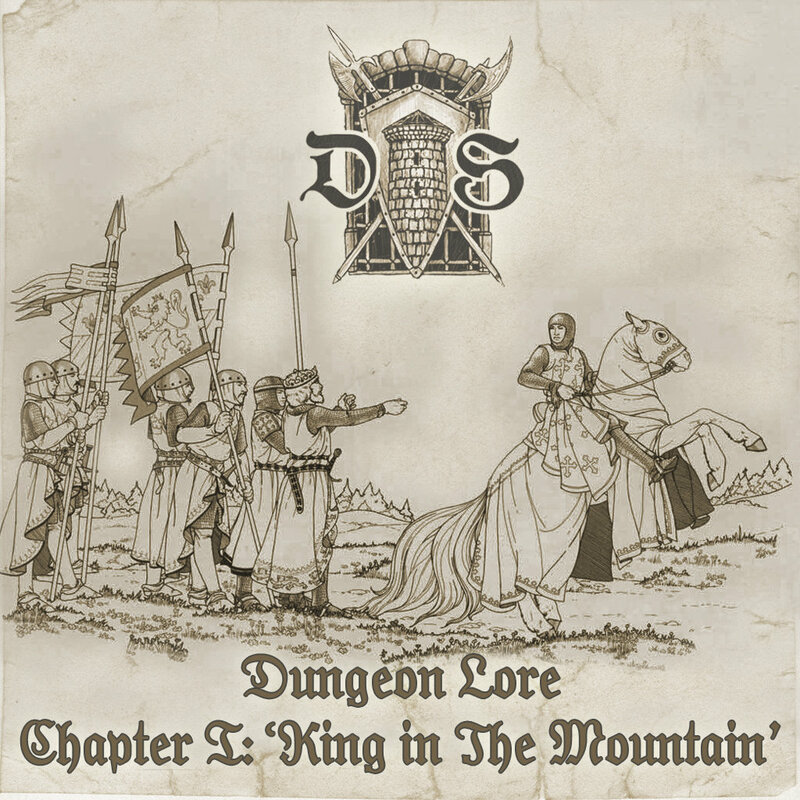 That feeling is conveyed pretty well here, and if the planned nine albums pan out, I'm guessing it might be approached as the traditional hero cycle, which might make the whole collection of works a very unified and powerful vision of dungeon synth. Overall the album seems pleasant but unfocused, bright and ancient. It has the strong Russian pagan vibe to it, but without descending into any reenactment-festival type sounds. It's not a "must-listen," however it does a great job introducing a lot of the modern Russian dungeon synth projects, particularly those associated with the VK dungeon synth page. It's fascinating as an original dungeon synth compilation, giving many short differing glimpses into that other world of fantasy dreaming. My issue with it, however, is that I think dungeon synth requires longer forms to come to a cohesive meaning. At best I was only able to get a sense of what was being communicated, rather than the complete vision. I think that comes down to this genre being about individualistic expression. I'm skeptical whether this can ever be fully realized in compilation form, however I'd love to be proven wrong. In any case, it's definitely a good way to learn where to delve further with these very talented artists. I must admit that I usually skip compilations, but after reading this detailed review I'm already listening this one. Great text. Amazing tracks, I too didn't expect something like this in a compilation release. It's fascinating that there is a Russian dungeon synth scene. You chose a very interesting material for a review. Excellent review as well.